Stephen Hawking has declared The Theory of Everything “broadly true” to his experience. So there. Truth in cinema is a big deal this year, with Selma, American Sniper, and The Imitation Game all subject to scrutiny and critical argument. As viewers, we shouldn’t get hung up on historical accuracy per se – filmmakers are telling stories, after all. Oliver Stone’s JFK (1991) was a fabulous fever dream, practically an alternate reality; it worked because Stone was not telling the actual story of Kennedy’s assassination – his real subject was the obsession of DA Jim Garrison, and like-minded conspiracy theorists. “Truth,” therefore, depends on the story being told. I’ve already argued that Ava DuVernay’s Selma is “essentially true” – because it’s about Martin Luther King, Jr. and not about President Johnson, or exactly how a specific piece of legislation was passed. I was harder on Clint Eastwood’s American Sniper, because the film’s intentions never crystallized; Eastwood declares the film anti-war, but it’s very loosely adapted from a gung-ho memoir – why tell (and change) that particular story if you intended to make an anti-war movie? 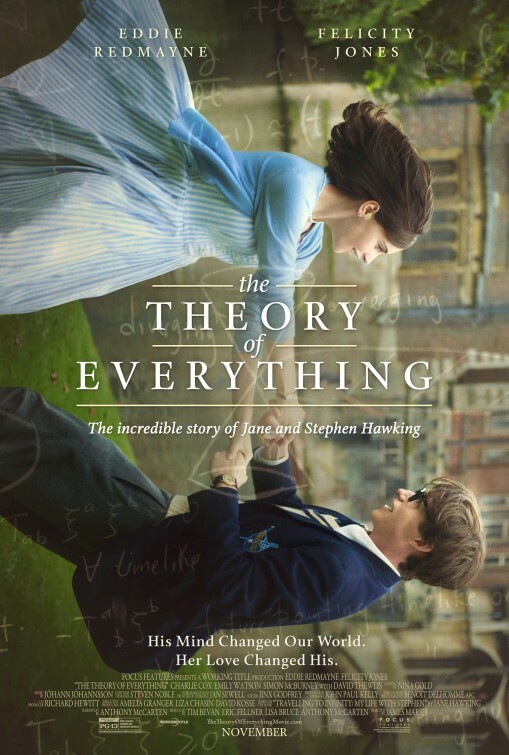 The Theory of Everything is based on Jane Hawking’s memoir, Traveling to Infinity: My Life with Stephen (which followed an earlier memoir, Music to Move the Stars: A Life with Stephen. Apparently her first book was a bit harsh.) The movie is not based on Stephen’s memoir, My Brief History. So is the movie Jane’s story? Not exactly. The film opens on him, and he occupies plenty of the narrative by himself. But it’s not really his story, either. Stephen Hawking is one of the most significant physicists of our time, but this movie glosses over his accomplishments – we aren’t shown how he did his work, what it consisted of, or what its impact has been; we see people looking amazed, clapping, and we see his bestselling A Brief History of Time in a bookstore window. So I guess the movie is “their story,” or to borrow Stephen’s phrase, “broadly their story.” And this is problematic. Both Jane’s and Stephen’s memoirs outline a far more compelling relationship than what’s on screen. It seems like the filmmakers didn’t want to upset anyone (Jane, Stephen, and many of the characters in the film are still alive.) But what’s onscreen is sort of bland. Eddie Redmayne is terrific as Stephen Hawking. My wife, who works with people who have all kinds of disabilities, especially liked how he subtly conveyed the physical progression of Hawking’s disease. Technically, he’s amazing. Unfortunately, the gold standard for this type of role is Daniel Day-Lewis’ Christy Brown, in My Left Foot (1989). I kept missing Day-Lewis’ fierce humanity as I watched this film, which isn’t Redmayne’s fault. It doesn’t help that Brown was an artist, and Hawking is a scientist; it really doesn’t help that this version of Hawking simply isn’t very fierce – he’s twinkly, and he seems more inclined to care and cry for those around him than the actual “emperor Hawking,” as the actual Jane has called him. Jim Sheridan wasn’t concerned if we liked Christy Brown, and the result was indelible. Director James Marsh cares very much that we like the Hawkings, and the result is milquetoast. I liked a lot of what Marsh and cinematographer Benoît Delhomme did with the camera and color filters. Especially when they took Stephen’s point of view, the subjective cinematic effects were suitably disorienting. I just wish they’d used those cool techniques on a different subject. I could sense what they were going for in the nostalgic montage scenes, the edge of the frame out of focus and slightly damaged, as if frayed by age or being left out in the sun; at the same time, many of those effects (slow motion, out of focus, blurred colors) suggest someone whose mind is slipping away, instead of his body. So I wished in vain for a cinematic representation of an astonishingly quick, genius mind. The title of the movie is its thesis. The 2-minute coming-attraction trailer for the feature proves the thesis. So the movie is redundant. Actually, it becomes less effective as it goes along. Marsh includes a closing sequence that echoes one of Hawking’s questions: Can we go back in time? I expect this leaves many in the audience quite moved. But the real Stephen Hawking hasn’t found the theory of everything; the movie hasn’t, either.